At the Law Office of Allen & Rector, P.C., we serve the needs of businesses from the initial formation of new corporations or partnerships and assist in general business legal matters in contract drafting and business litigation. We also represent in the purchase and sale of real estate and all aspects of real estate ownership. At the Law Offices of Allen & Rector, P.C., we prepare living trusts, wills, powers of attorneys, and any other estate planning documents necessary to implement our clients’ estate planning needs. We assist families with Medicaid planning and death tax issues and planning. We have prepared a brief overview of your estate planning options in Missouri. Hopefully this will be of benefit to you. We look at what you assets and listen to you goals and then match the estate planning tool that is right for you and your family. We want to ensure you have control of your things during your life and that your things go to whom you want upon your death. Our goal is to avoid the costs and delays of probate, avoid death taxes, and plan ahead for the possibility of long term nursing home care, and to assist your loved ones at your death. DO NOTHING. If you die without an estate plan, then someone else makes these important decisions for you. In Missouri there are a series of laws called “Intestate Succession”. These laws determine where you things go and who receives them. Your estate is then probated with the associated costs and delays, you lose privacy as your affairs are then a matter of public record. LAST WILL AND TESTAMENT. If you die with a Will your wishes are carried out, and it is generally inexpensive but again your estate is probated with all the same cost, delays and lack of privacy. It should be noted that probate generally costs your family much more than the cost of just doing a Trust in the first place. NON PROBATE TRANSFERS LAW. In 1989 the Missouri legislature enacted a series of laws giving you the right to do certain documents that avoid probate. (Examples include: beneficiary deeds, T.O.D. designations on titles, P.O.D. designations on bank accounts, etc.) These document work well on very simple estates and do avoid probate. These documents are not however very flexible and do not allow for death tax planning, or planning for long term nursing care. They are not overly expensive depending on the documents prepared. REVOCABLE LIVING TRUST. These documents are tried and true and have been around since the days of the Roman Empire. Once prepared, they avoid probate, avoid or greatly reduce death taxes, and allow for Medicaid and nursing home planning. They are private documents keeping your private matters private. They are very flexible and within reason “If you can dream it up, we can write it up”. They are somewhat expensive depending on the documents prepared, and the work involved in carrying out your wishes. It should be noted that a Trust generally more than pays for itself, by avoiding probate. 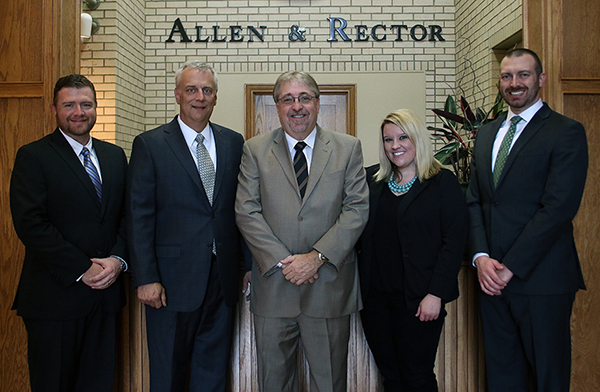 At the Law Offices of Allen & Rector, P.C., our attorneys regularly assist clients with complex divorce cases. When substantial assets are at stake, we carefully address complicated tax planning, property division and support issues to protect our clients’ best interests. Working closely as a team, our divorce attorneys collaborate with investigative, business and real estate appraisers, and investigators to ensure we have all the information we need to analyze each case. Our attorneys are familiar with the issues involving corporations, stock valuation and closely held businesses. With expertise and knowledge derived from two decades of experience, our law firm is adept at handling divorces involving assets to $10 million and above. While conflicts within the family are always upsetting for everyone involved, few domestic relations problems match the legal complications and emotional upheaval of divorce. When divorce is inevitable, a trusted matrimonial attorney can lend the valuable support you need to effectively resolve issues surrounding the dissolution of your marriage, from alimony, child support, custody and visitation to questions of parenting rights, and division of assets and debts. No matter when you need legal help, the Divorce Attorneys at the Law Offices of Allen & Rector, P.C., are here for you. You may call us toll free, day or night, at (866) 228-4995 or (417) 532-8300. We welcome your inquiries. Whether you are certain you want to end your marriage or are still weighing pros and cons, learning about the basics of divorce law and the divorce process can benefit you. If you decide divorce is the only answer to resolve your marital conflicts, seeking the legal advice and guidance of an experienced family law attorney will help protect your rights as well as your long-term financial and emotional health. At the Law Offices of Allen & Rector, P.C., we handle all areas of family law from adoptions, child custody matters, paternity, child support arrearages or modifications of prior decrees. We handle any case with the utmost discretion. When you are charged with a crime or a loved one in your family is accused of a criminal offense, you will be upset and may be frightened, especially if you do not fully understand the charges filed against you or the criminal procedure. At the Law Offices of Allen & Rector, P.C., we have been defending the rights of Missourians arrested for criminal violations since 1988. Our attorneys handle a full scope of criminal matters, from minor infractions and misdemeanors, such as traffic violations and speeding tickets, to the most serious felony indictments. We represent clients facing criminal charges in Laclede and Pulaski Counties and around the entire Missouri area. Regardless of the charges filed against you, the focus of our criminal defense is aggressive protection of your legal rights and seeking a quick and fair resolution of your case. Decades of experience dealing with criminal matters and our attorneys’ familiarity with the Missouri criminal justice system can make a crucial difference in the outcome of your case. When you are dealing with criminal allegations, before you talk to anyone even the police call our firm at (866) 228-4995, (417) 532-8300. Our attorneys stand ready to take your side and employ our expertise on your behalf.